Void | Comments, Code and Qt. I just have to put it out here; I am now a Nokia Certified Qt Specialist which means I have the right to use the logo below. I have no idea where I would use it in the future, so let's have it at least here on my blog 🙂 It's nice to be able to join the club of Qt experts. Under NDA I cannot speak about the test itself, but I can tell you that it had some tricky questions as well 🙂 But please instead poke me about any Qt question! I am a MeeGo, Maemo and Qt guy, but I have been working with Nokia for a long time to have been using Symbian devices a lot. 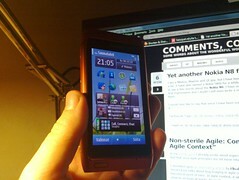 A have also owned a Nokia 5800 for a while, before I got my Nokia N900. I think I have enough credibility to be able to say a few words about the Nokia N8. I have only been playing with it for some hours now so these are really just my first impressions and I doubt I will even write a more thorough review since the Internet is probably already filled with them. I would also like to say that since I have been using the Nokia N900 for a year now, I will automatically compare the N8 to it.